Are Your Oil Treatments Keeping Your Hair From Growing? Since learning to care for my hair, I have been a huge fan of oils. I use them to seal my hair and also sleep with them in my hair overnight, thinking it was a nice moisturizing and strengthening treatment. Coconut oil has always been my favorite. Is your hair dry all the time? Recently I have come across several articles and points online that have challenged the “oil as a moisturizing treatment” idea. I have learned a lot- primarily realizing why my hair is still uber dry despite all these fabulous oil treatment s I was doing religiously. Maybe I am the only person who misinterpreted oils but I figured if I got confused, others may have too. “Coconut oil , almond oil, olive oil etc... One of the most common questions asked in salons is if they really hydrate your hair in any way. When oil is applied to dry hair it does coat the cuticle of the hair shaft, which is the outer layer of your hair. BUT--all of it is not being absorbed internally into your hair. Coconut oil absorbs into the hair the most out of all the oils but is not hydrating your strands, it works to reconstruct. We may think the hair is soaking up all the oil, but check your pillow cases or wherever you are sitting to see where a lot of the oil is going. Here is where the real problem comes in when you apply oil to dry hair. The oil can act as a barrier--preventing hydration, repelling needed moisture and resulting in dehydrated, dry and brittle hair. 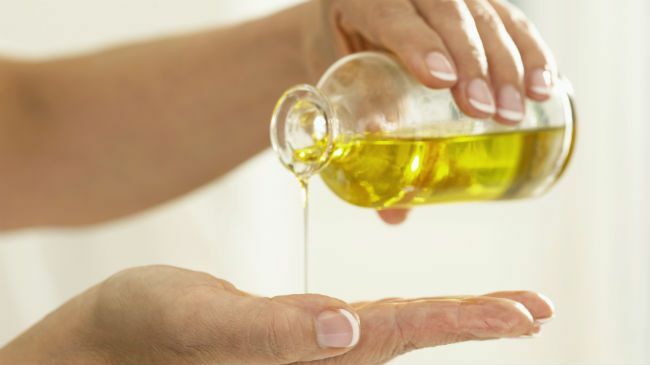 Oils clog the hair follicle if applied directly to the scalp. The hair needs moisture to look and feel amazing. Moisture lubricates and hydrates our strands. Ever notice how much easier your hair is to comb while it is wet? A conditioner/treatment with moisture retention properties that has a good balance of protein & moisture (important for strength and elasticity) are best . The oils on the scalp part mentioned baffles me. I’ve been using an essential oil blend to help promote hair growth for years, as the properties in the essential oils are supposed to help with growth. I’m just going to leave that point alone and take it as you will. But for what else was mentioned- Oh no I didn’t want anything to PREVENT moisture from going into my hair! Wondering if I should continue with my 2x a week coconut oil overnight treatments, it turns out the answer is still yes. Coconut oil, though not moisturizing is still incredible for the health of the hair. It has a small molecule and can penetrate the hair shaft- one of the only hair oils to do so. It doesn’t nourish the hair but it protects against water fatigue as well as loss of keratin. My hair does look a bit shinier after my coconut oil treatments. But at least it makes sense why my hair still isn’t properly hydrated, and still is so thirsty, despite giving it as much TLC as one possibly can. I was doing it wrong. I will still coconut oil my hair. After all, I do color it causing damage and I need the repair. But I may try cutting down to once a week. I already do deep treatments each time I wash but I am refocusing on making sure one of those treatments are solely moisture based, especially with the dry winter air practically here. Properly moisturized hair can help prevent breakage and keep length retention. There are so many hair theories out there and when it comes down to it, proper hair care truly is a science. Remember, every head of hair is different and will react differently to ingredients, products, and regimens.